​LITTLE ROCK, Ark. – Fifty community leaders have successfully completed the year-long Delta Leadership Institute Executive Academy, a program of the Delta Regional Authority. The Executive Academy is a training program that brings together business and community leaders from each of the eight states of the Mississippi River Delta and Alabama Black Belt regions for a collaborative leadership development experience, emphasizing regional approaches to growing local economies and creating opportunities for the people of the Delta region. Each graduate completed leadership development coursework and field studies in the year-long program that included five sessions in Delta communities and one session in Washington, DC. In addition to the program certificate, participants graduate with an industry-recognized certification in Crucial Conversations. Present for the ceremony were Arkansas Governor Asa Hutchinson, DRA Federal Co-Chairman Chris Masingill, Alternate Federal Co-Chairman Mike Marshall, and Sandy Dunahoo, commissioner of the Department of Local Government and Governor Bevin’s designee to the DRA Board. The DRA is a federal-state partnership created by Congress in 2000 to help create jobs, build communities, and improve lives through strategic investments in economic development in 252 counties and parishes across eight states. Through the Rural Communities Advancement Program, the DRA has provided leadership development to more than 400 community leaders over ten years and strengthened regional collaboration with its Delta Leadership Institute. 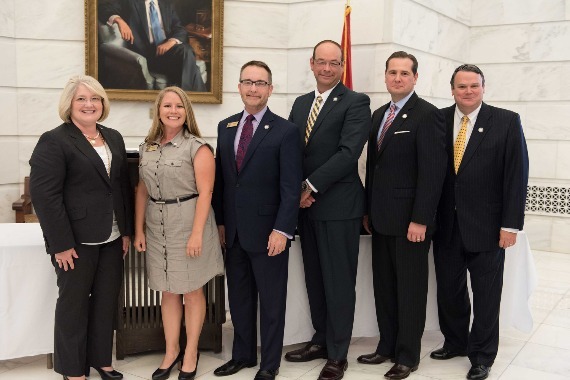 Picture Caption (left to right): Sandy Dunahoo of the Department of Local Government, Brandi Harless of Paducah, Mark Lee of Madisonville, Chris Wooldridge of Murray, and Chris Masingill and Mike Marshall of the Delta Regional Authority.